Henry J. Kaiser, as most everyone knows, was a West-Coast sand & gravel & cement magnate who had successfully handled the Hoover Dam project and went on to build Liberty ships during W.W.II. He also was a lover of cars and had established an experimental automotive development lab in California with the thought of producing a post-war car. Interestingly, he favored front-wheel drive and fiberglass bodies. Joseph Frazer was a founding member of the Chrysler Corporation and moved to Willys Overland in the late 1930s. He bought up the Graham-Paige Motors Corporation before the war. He too anticipated the demand for new cars once the war was over and went looking for investors. The two tycoons met in 1945 and almost instantaneously agreed to form the Kaiser-Frazer Corporation. Their aim was to build the first truly modern post-war automobile. They believed that in order to beat the Detroit-based automakers to the punch, a new design had to be developed very quickly. Two prototype cars, one a front-wheel-drive, were unveiled in January of 1946, to eager would-be dealers and the general public. Within three months over 1/2 million orders were taken. No cars had been produced yet! The front-wheel-drive car was to be called the Frazer. It was revolutionary, well designed and entirely too complicated for any reasonably-quick production cycle. Therefore, plans for the car were scrapped and from that moment on the Frazer would be a differently trimmed version of the Kaiser. The Kaisers were designed by the famous Dutch Darrin. They were modern in look, with the "slab-side" design favored by post-war buyers. Henry J. himself believed in the concept of utility in his cars and insisted that they be versatile as well as reliable. The resultant models — the Traveler, Vagabond and Virginian — had folding rear seats, large cargo decks and the first "hatchbacks", as well as one of the first "hardtop" and four-door convertibles. 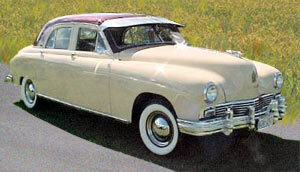 For $2,088 (in 1949) you could own a Kaiser Traveler. Standard equipment included a rearview mirror, interior light, turn signals, bumper guards and a jack. Optional equipment included a heater, radio, whitewalls, overdrive and fender skirts. Power for all the Kaisers was a 226 cubic-inch L-head six. It produced 112 horsepower and was a good engine, but would ultimately be one of the reasons for the failure of the Kaiser line. All transmissions were 3-speed manual, column-shifted. The Kaiser was 206 inches long, with a wheelbase of 123 inches. The seats were well known for their comfort and there was plenty of room for all the passengers. Strangely, the spare tire was mounted on the inside of the left rear passenger door so that it wouldn't be in the way of the folding rear seat and cargo area. The tire itself was covered in a nice vinyl sack. Anyone who drove or owned a Kaiser would mention its solid feel and smooth, precise controls, along with the overall comfort level and lack of noise. So What Killed The Kaiser? Many things conspired to ensure the demise of the Kaisers. One problem was a serious difference of opinion between Kaiser and Frazer regarding production forecasts. Frazer believed that, by 1949, the postwar buying spree was dying down and production should be cut down in order to retool and design new models. Kaiser, on the other hand, believed in the quality of the cars and insisted on more sales efforts. He prevailed, and production was geared to that end. On top of that, Kaiser believed that the new V8 engines were a fad and he committed all funds to the development of a compact car, which would be called the Henry J.
Frazer was right, and the resultant glut of unsold Kaisers at the dealerships took over a year to clear up, including a facelift — involving fenders and trim — of many leftover 49s to make them 50s. The result of that fiasco was Frazer's departure from the company and a huge financial setback from which the company would never recover. Frazer's name was forever dropped from the product lineup, of course. If that weren't enough, there was the Big Three. They were not about to be caught off guard for long and they had read the public's minds as to what was wanted in a new car. Big, powerful engines, automatic transmissions and power options were going to set the trends for the 1950s. Don't ask us, we are just the reporters! Of course, one might assume that anyone who could build the Hoover Dam and then gear up to produce one ship every 4 days could have successfully built a car. It must be harder than it looks, since over 2000 U.S. companies have tried so far and failed. The thing to remember is that Kaiser-Frazer was the last independent, unaffiliated company to attempt to produce a nationally distributed automobile in this country. It didn't work, even though the car itself was every bit as good as anything on the market. Kind of scary, isn't it?